It’s almost 8 a.m. on a brisk, gray weekday morning in late fall. 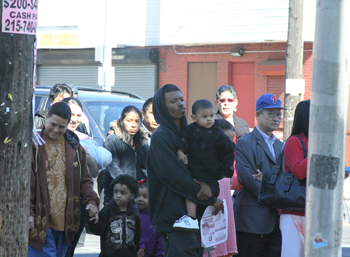 A steady stream of parents and children hurry across Lehigh Avenue toward Visitation of the Blessed Virgin Mary School. Down the street, the homeless line up at one of the local missions, waiting for breakfast. Store owners raise the graffiti-covered metal grates in front of their shops. Commuters catching the downtown train sprint past panhandlers and groups of young men loitering on the corner. Several ambulances scream by on the city street as the students pass through black iron fences topped with barbed wire. Once they bound up a few well-worn stone steps and pass through the door, they’re in a different world — one full of laughter and color and warmth. Safe for another day. 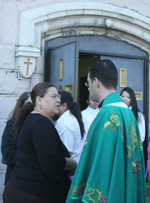 The Redemptorists arrived at Visitation Parish in the Kensington section of Philadelphia in 2006. The church, elementary school and the community center (named after Cardinal Bevilacqua) sit along several blocks at the corner of Kensington and Lehigh Avenues in the shadow of the elevated SEPTA tracks. The parish was founded in 1873, and the Redemptorists today serve about 7,000 parishioners, most of whom speak either Spanish or Vietnamese. The parish school enrolls about 480 students. Around the campus are banners and signs that read: Visitation BVM, Serving Our Community, Beacon of Hope. Read the rest in the spring edition of Plentiful Redemption.